This is a picture of the Green Knight hurtling into King Arthur's dining hall. 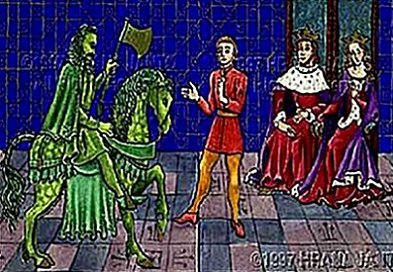 As we can see, by holding up an ax, the Green Knight is very disrespectful to the king, for such action normally suggests that one is here to cause trouble. Although we know that the Green Knight means no harm to the king, for he only wants to play a game, any normal person will feel endangered by his sudden entrance. We can also see from this picture that Gawain, as brave as he has been, is trying to settle the situation with the Green Knight so that the king and the queen can continue to enjoy their feast.